On our second visit to Bo Tai, the restaurant has only been open for five days, yet even on a Monday evening it is buzzing with happy diners. Zorawar and Dildeep Kalra have proven their mettle as successful restaurateurs time and again. This time they have added a Modern Thai restaurant and bar to the Capital’s gourmet dining scene. Bo Tai is thus a playful pun on ‘Bow Tie’, and ‘Tai’ is also a colloquial pronunciation of ‘Thai’. With two terraces overlooking the lush Mehrauli greenery surrounding the iconic Qutub Minar, we can safely say that Bo Tai offers the best ambience in this neighborhood. Bottom L-R: Scallop Carpaccio; Butterfly Prawns. The fare on offer is an array of Thai dishes that reflect the experience and creativity of Chef Sahil Singh, whose motto is to ensure that “at least ninety percent of the guests should go home happy”. While he has stuck to the traditional curries, there are many dishes that celebrate Thai flavours albeit with refreshing new twists: Singh prefers to grill the crab cakes instead of deep frying them; along with curried Ching Mai pork sausages, the menu also features duck sausages; and, an entire section is dedicated to European style grills, (again, with Thai ingredients). Each portion of the grills includes a protein, starch and some crunch. The grilled fresh water prawns, for instance, are served with a mildly sweet kafir lime biscotti. Vegetarians will enjoy grilled Portobello mushrooms that are stuffed with a chickpea mash. There is also a hearty Thai style vegetarian gumbo. All the curries – red, green, Massaman, Penang and yellow – have the option of vegetables, chicken, lamb, prawn and duck. Enough thought has also been given to the presentation. 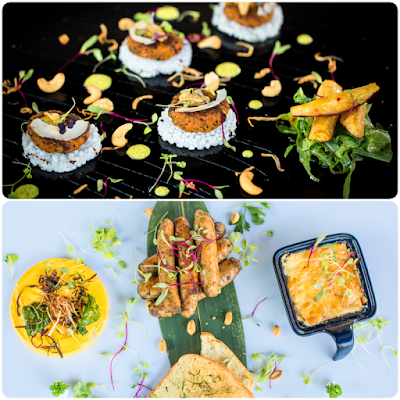 Not only is the plating Instagrammable, but also practical in keeping with the cuisine on offer and the Delhi weather. 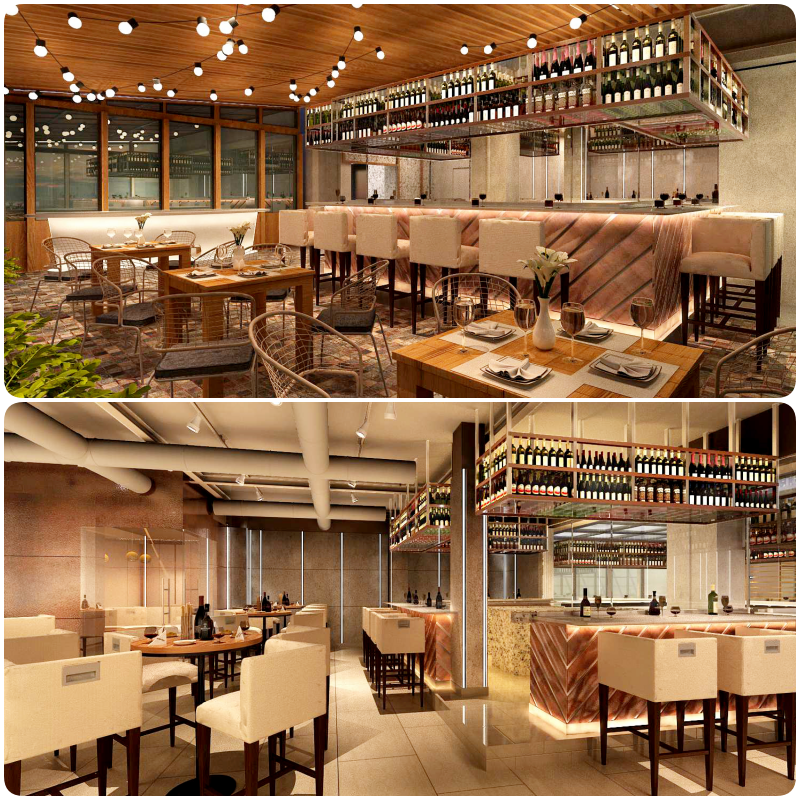 The scallop carpaccio and seabass ceviche are served on semi-frozen platters to ensure that the right temperature of the raw seafood is maintained optimally. For our next visit, we already have our eyes on the king oysters with mignonette sauce. The cocktails are as fab as the food. 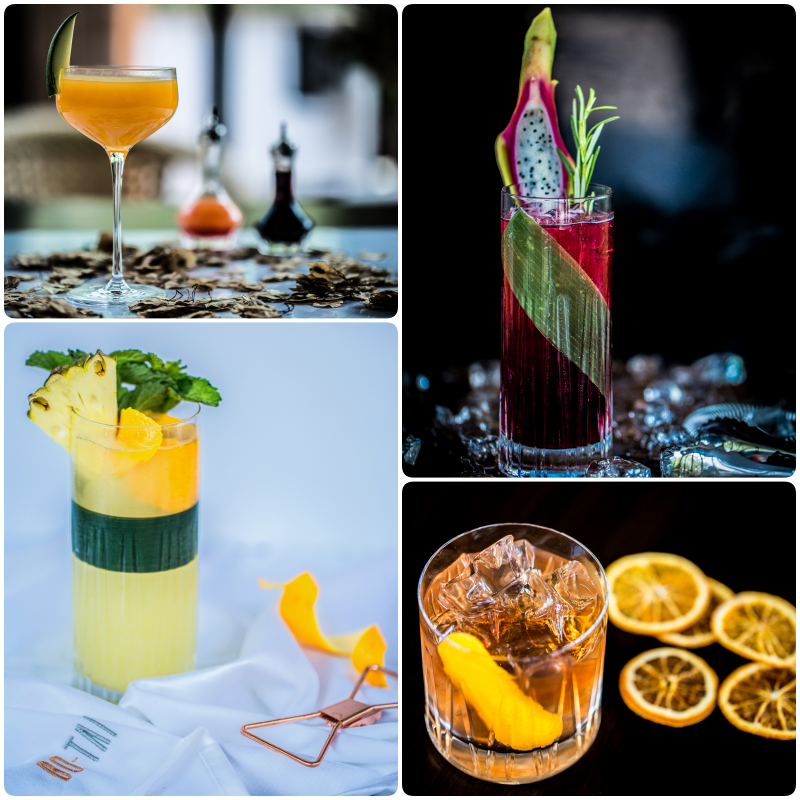 London-based DARE Hospitality consultants, have lent their signature style for a stellar bar menu and cocktails. Some are even inspired by ancient folklore of Thailand. We tried the Full Moon Festival, an ode to Loi Krathong, a festival celebrated under the full moon of the 12th month, when village folk flock to the rivers with colourful, handmade baskets filled with herbs and flowers and set them afloat with a candle light. In keeping with the name, this gin-based cocktail is served in a glass sphere filled with bright-coloured flowers. The aromatic drink opens a plethora of flavours with strawberry and rose syrup, housemade spiced vermouth, grapefruit, spiced orange syrup, lime and pandan tincture. Of course, there are many more to choose from, including the Pom-tam Cola made with Indian pomegranate and tamarind and a sophisticated and complex Bo Tonic using Seedlip Garden from the UK (a new zero alcohol distillate imported to Delhi especially for Bo Tai). 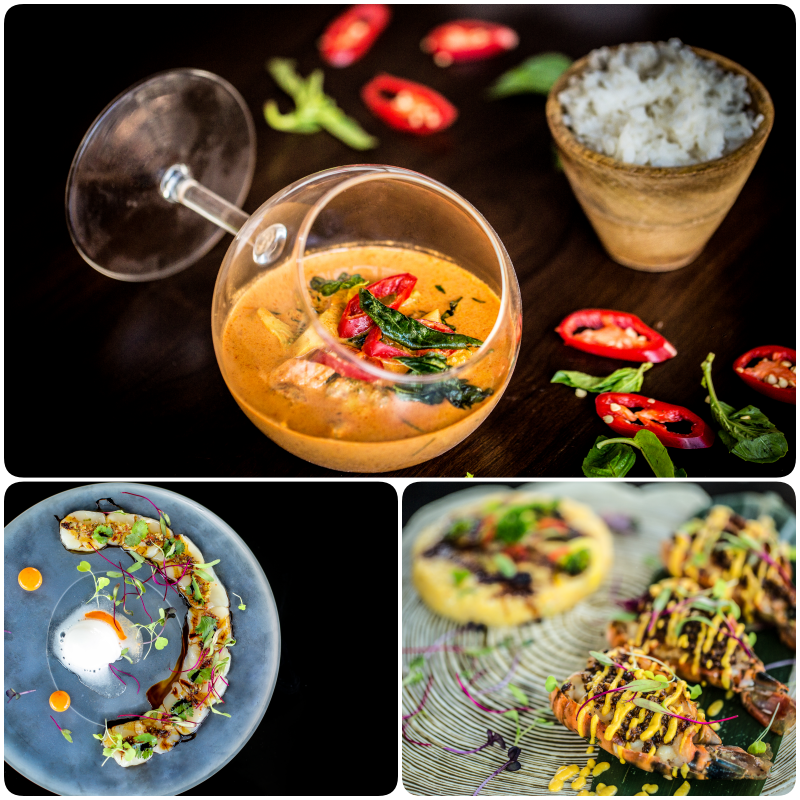 Chef Shail sums up the ‘concept’ of Bo Tai in a nutshell: “great Thai food and fantastic cocktails”. While we agree whole-heartedly, we’d also add ‘fabulous music and a fun vibe’ for a perfect night out. - Crab cakes with sago wafers. They balance the sweet meat of blue crab with lemon grass, kafir lime and Thai chilli. But instead of the usual deep fried version, this one is grilled. - Torched lamb chops smeared with a finger-licking sauce made with jaggery and tamarind. - Duck sausages with silken butternut squash and a rich potato dauphinoise. Bo Tai, 6/4, Kalka Das Marg, Mehrauli Road, Near Qutub Minar, New Delhi-110030. A version of this article first appeared in Eat Stay Love Magazine, July 2018 issue. One thing I want to talk to you is thank you. Your posts help me open my mind. I find them very interesting. They ease me in the hard time. Thanks for sharing your articles. Good food brings a smile to my face. I have very fond memories associated with food right from when I was a picky eater in my childhood to when I became very experimental with flavours and textures. Not only do I enjoy eating good food, but I love reading about it, watching tv shows on it, talking about it and of course writing about it. Oh, and I love eating out! Join me on my gastronomic journey exploring varied restaurants, talking to creative chefs and experiencing cities through their food culture. And since food and travel are intrinsically connected I am also happy to share some travel articles including my exploration of beautiful cities and some of the fine hotels that I stay at during my personal and professional jaunts. All this with one sole purpose - to help you indulge in fabulous food and fine living at some of the best domestic and international destinations.